All that blogging about nepitella made me hungry and so for dinner tonight, I whipped up this tasty dish with ingredients I had on hand. If you don’t have nepitella, you’re forgiven this time, and can substitute a mixture of basil and mint. So what is nepitella? Find out here. Step 1 Boil water in a large pot. When water boils, add spaghetti. Step 2 While water is boiling, cook mushrooms in about 2 tablespoons of the olive oil. Sprinkle with nepitella and salt. Step 3 Half-way through cooking, add the red pepper to the mushrooms. Add the capers too. Step 4 Cook mushrooms until well done. During the last five minutes, add the garlic (be careful not to burn). And add a half pinch of nutmeg (be careful, this spice is strong). Step 5 Drain the spaghetti and put it back in the empty pot. Add the mushroom mixture and stir. Add about 2 tablespoons of the olive oil and the butter. Sprinkle on the parmesan cheese. Add salt to taste and serve. It came to me in a dream: nepitella pesto. I thought that maybe I had invented the idea but a quick search online turned up one reference to it at a restaurant in New York called Osteria Morini. There they team nepitella pesto with buffalo mozzarella on crostini or with fresh whipped ricotta topped with peas and asparagus. I’m sure that doesn’t taste bad, but what were they thinking? Everyone knows nepitella pairs perfectly with mushrooms and artichokes: everyone, in the small minority of people in this country who have heard of nepitella. So let me let you in on the secret. Nepitella is an herb that grows wild in Tuscany (and in my driveway after I transplanted a small plant from my grandmother’s garden about 15 years ago). 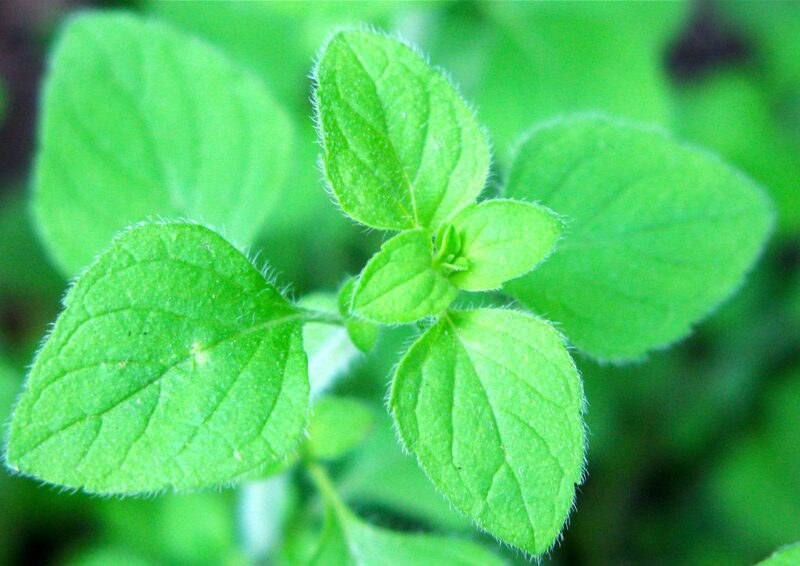 Some describe it as a cross between oregano and mint, but I believe it’s more like a cross between basil and mint. And I wouldn’t think of cooking mushrooms or artichokes without it. So when I was inspired to try to make nepitella pesto the logical use for it was to stuff mushrooms with it. And the result was perfect. The pesto by itself, without any cooking, was much stronger than a basil pesto: more earthy and with a sharp bite, almost spicy flavor. 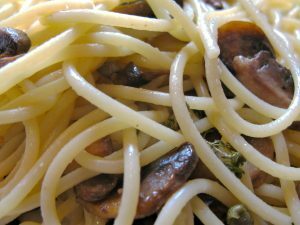 But when it cooked inside the mushrooms, the taste mellowed into a more mild buttery flavor: still very earthy but without the sharpness of the raw nepitella pesto. If you’d like to try this, finding nepitella will be a challenge, but a search online revealed a few places that sell the plant. Or just stop by my driveway: there this evasive plant grows wild in cracks and along narrow dirt patches along the fence. 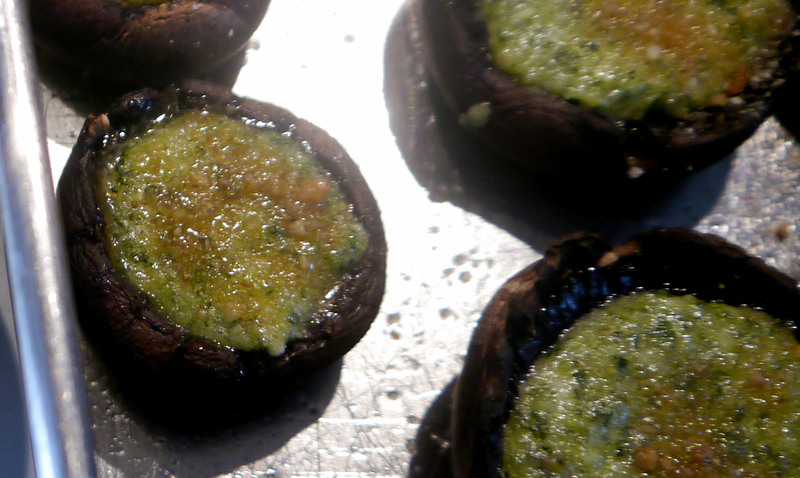 Making the pesto probably takes about 15-20 minutes; add another 20-25 minutes to make the stuffed mushrooms. Step 1 Put nuts and garlic in food processor with a steel blade and process for about 15 seconds. Step 2 Add nepitella leaves, salt and pepper. Step 3 With processor running slowly add the olive oil until it’s completely pureed. Step 4 Add cheese and process for another minute. Step 5 If you don’t use it right away, put in refrigerator with plastic wrap touching the top or with a film of olive oil on top. This will prevent discoloring. Step 7 Pull off stems, clean caps with paper towel. Step 8 Put clean caps in a baking dish that has been greased with a small amount of olive oil. Step 9 Spoon in nepitella pesto and bake at 350 for about 15 minutes. You can serve it as is or with a shaved piece of parmesan cheese on top and/or a pignoli nut.